Product #45619 | SKU DRLK3X500BVQ | 0.0 (no ratings yet) Thanks for your rating! With location shooters in mind, the Dracast LED500 Pro Bi-Colour LED 3-Light Kit with V-Mount Battery Plates and Stands for the photographer on the road. The kit is comprised of three LED500 lights, each with a multi-voltage power adapter, case, and a light stand. Three 7.2' light stands are also included. At just 4 lb, the LED500 Pro Bi-Colour LED is a lightweight option for location work, interviews, and small sets where colour accuracy, control, and flicker-free output are of major importance. Variable colour temperature from 3200-5600K or anywhere in between means that you can quickly match the prevailing ambient or artificial light balance with a simple twist of a knob. Dimming is equally convenient via another knob that adjusts the light intensity from 0-100% with negligible colour shift, and the low electrical draw of just 30W means a timely return on your investment. The durable anodised aluminium frame is supported by an oversized, U-shaped yoke with locking knobs on each side and a standard 5/8" receiver. The LED500 can be used worldwide, powered by the included 100-240 VAC adapter or by optional 12 VDC batteries. 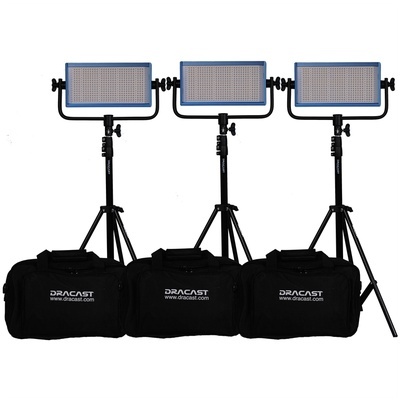 Ideal for location shooters, the LED500 Pro Bi-Colour LED 3-Light Kit with V-Mount Battery Plates from Dracast is comprised of three LED500 lights, each with a multi-voltage power adapter, case, and a 7.2' light stand. At just 4.0 lb, the LED500 Pro Bi-Colour LED is an ideal choice for location work, interviews, and small sets where colour accuracy, control, and flicker-free output are of major importance. Variable colour temperature from 3200-5600K or anywhere in between means that you can quickly match the prevailing ambient or artificial light balance with a simple twist of a knob. Dimming is equally convenient via another knob that adjusts the light intensity from 0-100% with negligible colour shift, and the low electrical draw of just 30W means a timely return on your investment. The durable anodised aluminium frame is supported by an oversized, U-shaped yoke with locking knobs on each side and a standard 5/8" receiver. The LED500 can be used worldwide, powered by the included 100-240 VAC adapter or by optional 12 VDC batteries.